How has your week gone so far? I am in a weird limbo between it is FINALLY Friday and it is Friday already?! This week has been a little crazy! We postponed painting our master bedroom last weekend so maybe we will tackle it this weekend. I went to the furniture store three times this week. Ugh! Our living room furniture is coming apart and the furniture company is giving us store credit to replace it. Unfortunately we haven’t foundÂ the perfect furniture yet. I would rather watch grass grow or golf on TV instead of furniture shopping. 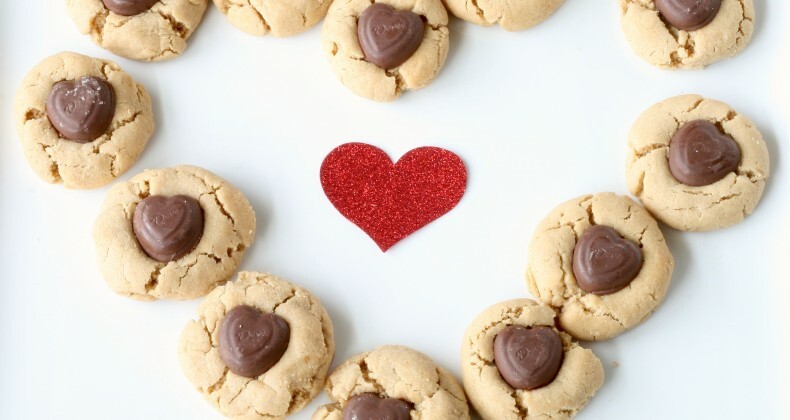 Anywhoodle, it is Friday and I have a recipe for peanut butter cookies with chocolate hearts. Perfect for Valentine’s day! 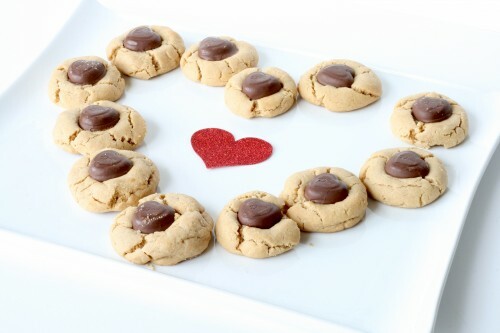 I made these peanut butter blossoms a Valentine’s day cookie by using Dove chocolate hearts. I like Betty Crocker’s recipe for peanut butter cookies, so that is what I used. Heat oven to 375Â°F. In large bowl, beat together sugars, peanut butter, butter and eggs with electric mixer on medium speed until combined Stir in flour, baking soda and baking powder. Bake 8 to 10 minutes or until edges are light brown. Immediately press 1 chocolate candy in center of each cookie. Remove from cookie sheet to wire rack to cool. Enjoy!